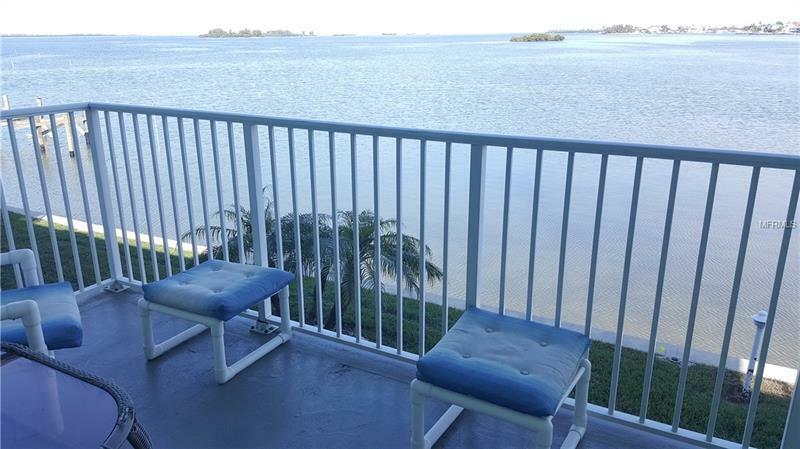 REDUCED--Amazing OPEN WATER VIEWS from this 2nd floor unit in popular Dolphin Pointe on DUNEDIN CAUSEWAY. This unit comes FULLY FURNISHED so just bring your wardrobe and toothbrush! The living room pit group is a sleeper-sofa. Updated kitchen cabinets and mica tops, water heater 2019, A/C and refrigerator 2017, bath vanity faucet 2019, hurricane-rated slider. Perfect for seasonal or full-time use, or rent it right away with a rare 30-DAY MINIMUM. Community features include a waterfront clubhouse with kitchenette & billiards, HEATED POOL, BBQ grill and a NEW fishing pier/dock is in the works. Grab your favorite beverage and prepare for endless dolphin, manatee & sea bird sightings from your WATERFRONT, OPEN BALCONY. You are in the hub of all the beach activity with nearby HONEYMOON & #1-RATED CALADESI ISLAND BEACHES. PINELLAS TRAIL is across the street. You are WALKING DISTANCE distance to Frenchy's, shopping, restaurants/bars, banks, pharmacy, marinas, Jolley Trolley & bus. Immerse yourself into eclectic Downtown Dunedin with Farmer's Market, Arts n Crafts Festivals, wine walks, parades, shopping, dining, craft beer & more! Countryside Mall, golf & Dunedin Stadium for Blue Jays' Spring training are also nearby and Clearwater Beach is only 20 minutes away. All ages welcome and one indoor cat. LIVE WHERE OTHERS VACATION!